Your favorite audio-visual Chinese lessons – now on the go, and downloadable for offline use! CultureAlley’s Chinese App for the iPad is launching on November 11th, 2013! Learn Mandarin Chinese while relaxing in your bed, or while in a flight! 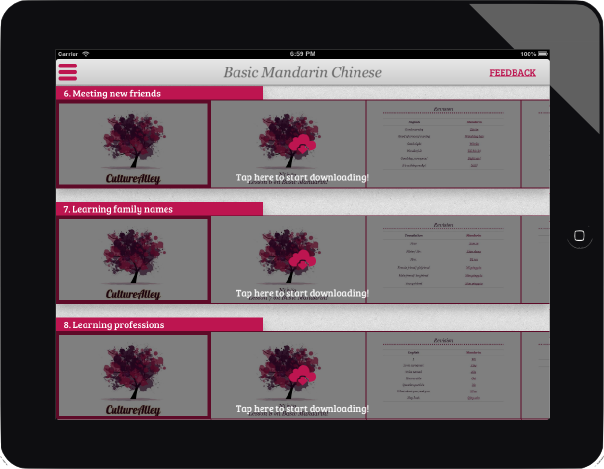 CultureAlley’s Mandarin Chinese course is coming on the device you love – the iPad. Loaded with downloadable content which allows all 30 audio-visual lessons and interactive quizzes to be available offline!